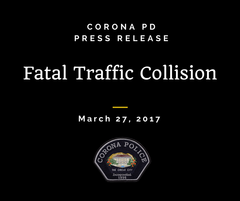 On Monday, March 27, 2017 at 10:10 AM, the Corona Police Department and the Corona Fire Department responded to a traffic collision involving a motorcyclist in the 1200 block of W. Sixth Street. Upon arrival, Corona Fire Paramedics pronounced the motorcyclist deceased. Subsequently, West Sixth Street was closed to traffic in both directions between Lincoln and Sherman for the investigation. Based on witness statements, the motorcyclist was traveling west on Sixth St. in the number two lane, when a commercial truck made a left in front of the motorcycle resulting in a broadside collision. The Riverside County Sheriff-Coroner’s Office identified the victim as 35-year-old Rudy Villarreal Jr., a San Bernardino resident. The driver and passenger of the truck were not injured. The Corona Police Department's Collision Response Team is handling the investigation. At this time, it is unknown if drugs or alcohol were a factor. The driver of the truck has not been arrested, the investigation is ongoing.